The clockis ticking towards the second plannedFalcon 1 rocket test for the private spaceflight firm Space ExplorationTechnologies (SpaceX), nearly one year after an unsuccessful launch debut. 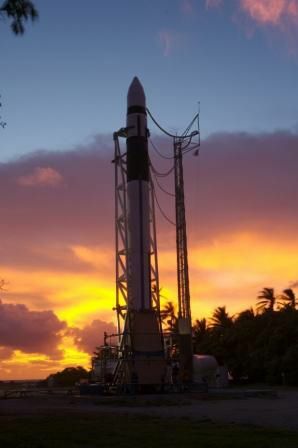 Liftoff isslated for 7:00 p.m. EDT (2300 GMT) from SpaceX's OmelekIsland launch site on Kwajalein Atoll in the Pacific Ocean's MarshallIslands [image]. "The flightreadiness review conducted [Sunday] shows all systems are go for a launchattempt," SpaceXCEO Elon Musk wrote in a mission update to his El Segundo, California-basedfirm's website, adding that the planned space shot could be delayed "if we haveeven the tiniest concern." SpaceX hasa four-hour window to launch today's Falcon 1 mission, with additional dailyflight opportunities through March 22. Abooster equipment concern, since resolved, and range safety personnelissues delayed the planned launch several times. The only glitchMusk has reported for today's planned space shot involves an anomaly with theglobal positioning system portion of the Falcon 1's guidance system. Thebooster is designed to fly primarily on an inertial navigation guidance system,using the GPS system as an aid to refine its path, he added. SpaceX'supcoming launch, dubbed DemoFlight 2, is a demonstration for the U.S. DefenseAdvanced Research Agency (DARPA), which also funded Falcon1's ill-fated debut in March 2006 [image]. That firstFalcon 1 test endedshortly after liftoff after a fuel leakand subsequent fire forced an engine shutdown about 34 seconds into theflight [image].Initially thought to be the result of human error,the rocket failure was ultimately traced to the corrosionof a small aluminum nut. Since lastyear's test, SpaceX has literally made hundredsof improvements to both the Falcon 1 rocket and its ground supportfacilities on the Kwajalein Atoll, Musk told SPACE.com in a telephoneinterview. "We didn'tjust say we'll go back to the launch pad with the same vehicle and launchagain, and see if it works," Musk said. "We really have developed version twoof Falcon 1." The year ofimprovements has given SpaceX more confidence that, even if today's launch isunsuccessful, the spaceflight firm will be able to recover relatively quickly,Musk added. "Ifanything goes wrong with this launch, I wouldn't expect our next launch to be ayear from now," Musk said. "We've made every improvement we can think of. Ican't think of very much we could do to improve the robustness of the design." SpaceX'sFalcon 1 rocket is a two-stage booster that stands about 68 feet (21 meters)tall and carries a reusable first stage powered by the launch firm's Merlin 1engine. Designed tolaunch small satellites intolow-Earth orbit, Falcon 1 rockets are expected to haul payloads of up to 1,256pounds (570 kilograms) into space for about $7 million per mission, Musk told SPACE.com. The boosteris the first of SpaceX's family of Falcon rockets that includes the Falcon 9 rocket,a heavy-lift launcher currently under development to loft the Dragon crewand cargo capsule. The Dragon and Falcon 9 projects [image]comprise the SpaceX's entry for NASA's Commercial OrbitalTransportation System (COTS) to provide crew changeand resupply flights to the International SpaceStation (ISS). "Falcon 1is our test vehicle really," Musk said, adding that the technology used in thesatellite booster will be upgraded for Falcon 9 launches. While theprimary goal of today's planned space shot is to demonstrate the Falcon 1rocket's launch capability, the booster is also carrying a pair of experimentalpayloads, SpaceX officials have said. GwynneShotwell, SpaceX's vice president of business development, has saidin the past that the second Falcon 1 rocket will carry a low-cost satellitecommunications transceiver and an experimental autonomous flight safety systemduring its upcoming launch. The missionis the first of at least three scheduled Falcon 1 missions for 2007. A plannedsummer launch is expected to orbit the TacSat-1 satellite for the U.S. NavalResearch Laboratory, with a follow-up mission to launch Razaksat - a Malaysian Earth-observation satellite - later thisyear. "Falcon 1is intended to be the smallest useful orbital launch vehicle," Musk told SPACE.com.